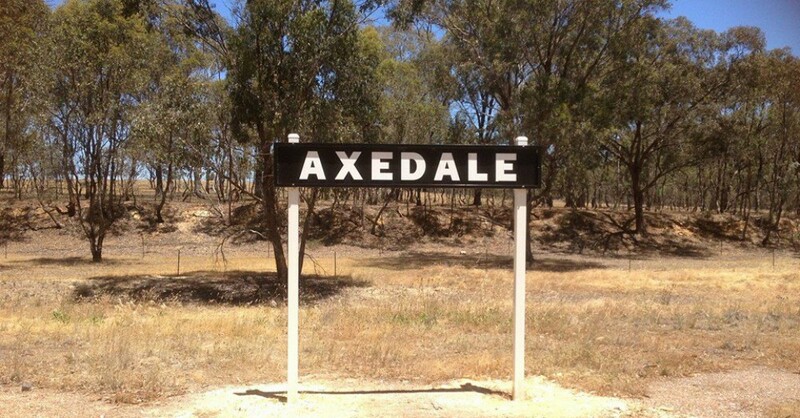 One of the exciting projects of 2015/2016 for local community group, Axedale Our Town – Our Future is the Axedale Historic Loop project named “A Town Once Divided Now United”. Stage 1 was completed late in 2015. This involved signs being placed at significant historic sights around Axedale. At the community park there is a main sign with map and directions to the various signs around the township. The sign below is an example of the signs and the information given, just to entice you to come and check them out for yourself. This sign is placed at the Axedale Tavern and gives historical information about the Hotels of Axedale. The loop can comfortably be both walked or cycled – a great opportunity to involve the family and combine fitness and history. Stage 2 which is now in progress, is the development of a smart phone app. Further information on the app will be posted when it “goes live” in the very near future. *Research for the project was done by historian Robyn Ballinger. *Funds for this project were provided The City of Greater Bendigo and Heathcote and Districts Community Bank Branch. A Local History Grant from the Public Records Office of Victoria of $12,000 was also received to develop the Smart Phone App. This entry was posted in Axedale, Uncategorized and tagged Axedale, History by Jennifer Jones. Bookmark the permalink.